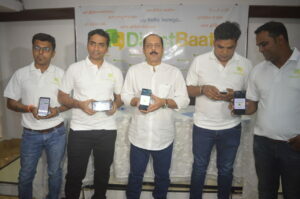 In a packed house of media persons and journalists at the Press Club Mumbai, former encounter cop Sachin Waze today unveiled the most secured communication suite on earth,’’DirectBaat’’ offering features including direct messaging, file sharing, audio-voice calls as well as video calls. DirectBaat ensures optimum safety, enabling you to seamlessly share your data through your smartphones. The cutting-edge communication suite is the brainchild of Mr. Sachin Waze and Mr. Sanyog Shelar and has undergone rigorous security assessments and testing on multiple benchmarks. Harnessing end to end encryption, DirectBaat furnishes you with the confidence to message, talk, share files with colleagues and clients via a single state of the art application. It is important to understand that unless you encrypt them your communications are not private. Every activity you perform over the web passes through a layer of servers before it reaches its destination. It could be intercepted midway and read at any point. Then endless possibilities of analysis of your conversation/communication and sharing further to various unknown vendors for various purposes. This is where encryption comes into the picture for ensuring your privacy. The End to End encryption leveraged by DirectBaat also ensures that no third party can comprehend the communication between you and your conversational DirectBaat partner. Furthermore, the dynamic generation of crypto-keys makes the decryption of the messages impossible, making it the most secured communication tool on the earth. We have launched this application to build a real privacy environment for the citizens of our country. This application will help you to keep your privacy intact. Since DirectBaat operates on very secured and practically un-snoopable software and hardware platforms even we can’t read anything other than user’s registration information,’’ said Mr. Sachin Waze, Former Encounter Specialist, on behalf of SIGMA SSG and VNT. “It’s a small contribution to India’s step ahead towards creating a real sense and effect of ‘Privacy’ as well as marching towards a great feeling of un-snoopability which will result into confident communication.” He further said. The application is priced for ₹ 25,000 which is the costliest app on the earth. But on the request of a student Mr. Sachin Waze has reduced the pricing from ₹ 25,000 to an Introductory offer ₹ 500. It is till 31st December, 2018 that the most secured communication suit will be available in this price.